The montage: Here we have a bunch of different pictures from the laryngeal videostroboscopy. I marked green on some of them. Those are problems. 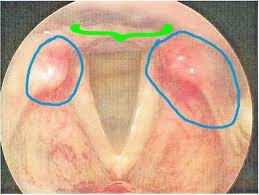 The those things circled with purple are my vocal cords. In the green bracket, there is a space that doesn't come together like it should (causes airiness of tone on higher notes). The blue circle indicates red irritation and the blue star indicates how that whole area should be colored (not blue like the star, but the nice pale color around the star). Why it's happening: I have Laryngopharyngeal Reflux (LPR) or Throat Reflux. It is a type of acid reflux that takes place only in the throat so one doesn't really know they're having it (meaning the acid isn't making it up to where I can taste it). The acid is not being blocked by the epiglottis (the device that blocks the airway when you swallow food) and so it gets on my cords and irritates them. The reason for the gravelly voice is because of excess mucus back there. When the body has irritation (like acid burning vocal cords), mucus is produced to heal the injury. Karin, the vocologist in Dr. Palmer's office and the one who conducted the laryngeal videostroboscopy, said that the larynx is as sensitive as they eyes. For example, if you were to put three drops of acid in your eye a week, you would have red, irritated eyes. Same with your vocal cords. Just three drops of acid a week can do damage. In fact, vocal cords should be as white as the whites of your eyes (these photos don't show it well, but my vocal cords had a bit of pinkness going on). This is me exhaling and not talking. Blue circles indicate red irritation. The green bracket is bracketing irritation caused by acid leaking around the epiglottis (the top of the image is where the epiglottis seals off). The skin is appears bumpy and rough. That is caused from the acid. Not much acid-- just three drops a week. Crazy. So I'm taking a couple of prescriptions to help me stop refluxing and in a while, my chords will be healed up and not irritated and I won't have all that mucus that makes me gravelly or the gap that makes me sound airy. After the Dr, we had lunch with Nick. He made us some Brazilian slave goodness called feijoada. He gave mom a Valentine from Krispy Kreme for a free doughnut so we had to go by. We only got 1/2 dozen and had intentions to share them with dad. Well, when we got home I hid the doughnuts. We had dinner and then Mom and I went to Puccini's La Boheme. After the opera, mom and I decided we needed to finish our audio book that we listened to on our trip to/from Salt Lake (Roll of Thunder, Hear My Cry by Mildred D. Taylor in honor of Black History Month). But if you listen to a book, you'll need a snack. So we had ice cream. And doughnuts. And dad wasn't invited. I told mom that I was concerned about his weight, so we shouldn't let him know about the doughnuts. Hahahaha! Oh goodness (laughing quietly to myself). I'm sure glad dad doesn't read this blog. This is getting rather lengthy. I'll wrap up now. Ah, you are so my child, Eric. I, too, am glad that your Dad does not read your Blog because *I* ate the last doughnut I had generously saved for him! I ate it this morning, thinking he must not have wanted it...it was right by the toaster and he bypassed it for toast. So, I had to eat it while it was fresh(er).